I just started a Youtube Channel on Sportfishing Boats. Need your input. 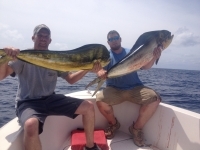 Posted: Mon Apr 08, 2019 3:07 am Post subject: I just started a Youtube Channel on Sportfishing Boats. Need your input. Welcome to the new youtube channel "Sportfishing Boats". This is a homegrown Saltwatercentral/Fryingpantower Channel. David puff the site admin did the Channel art and graphics for it. (Btw, he is a great graphic artist if you need one.). This channel focuses on fishing boats. How they are designed and built, how to repair and maintain them, and how to get them setup for fishing. There won't be any fishing or fishing "how to" in these videos..... because, as some of you know first hand... I'm a pretty average fisherman! Just boats. Something I atleast know a little about(albeit that is debatable ). I put the first videos on gelcoat oxidation removal down in the boatyard forum. Let me know what you think. If you have any ideas for topics for future videos, I'd love to hear them! Please Subscribe if you like the channel. You’ll get notifications when new stuff comes out and it helps the channel grow. Nice down to earth video with a person I can relate to - this is by far my first priority when I'm looking for a guide in which I can trust the author = keep it up. U gotta love fishing - Love fishing and sharing it on my blog. Thanks! You can always reach me here. Input and feedback always appreciated because I have no idea what I’m doing. Just trying to figure it out as we go along.